As a leading Hamilton SEO expert, many people have asked me to write a guide to the best SEO strategies for 2018. In this guide I’m going to show you how to get the best SEO in Hamilton Ontario to rank highly in Google search whether you’re going-it alone or if you’ve chosen to hire an SEO expert. 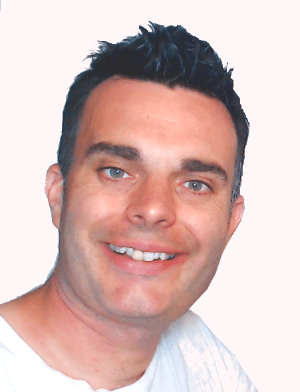 I’m a local SEO expert in Hamilton (or a Google Ranking expert, as some of my clients call me). Speaking of which, If you’re in the area, I would love to hear from you. Contact me today. So much has been written about how to do SEO for a business or blog. What has never been done, however, is an expert’s SEO guide specific to this place of ours that we all know and love. So, this is a specific Hamilton SEO guide. As a local Hamilton SEO expert I hope this guide answers many questions for business owners in the area. In this expert SEO guide I’ll share the best SEO strategies of 2018, strategies you can use to improve Google ranking position. I’ll show you how to get the best SEO in Hamilton Ontario, whether you’re a realtor, a lawyer a dentists or, well, anything else. In this Hamilton SEO guide, I, your Local Hamilton SEO expert, will cover everything from the basic Google ranking signals for search, to local SEO for Hamilton, to working with other businesses in the area to boost your SEO in Hamilton Ontario. And, unashamedly, yes, because I want to use this guide for my own local SEO in Hamilton Ontario. This guide is going to cover everything. My aim is to teach business owners in Hamilton SEO to improve Google ranking position so, you know, this city can shine online as well as offline. .
SEO stands for “Search Engine Optmisation” (usually spelt with a “Z”, although proper Canadian spelling is with an “S”). SEO is about ranking highly in Google search and other search engines. The ultimate aim of any SEO strategy is to improve ranking position in Google search. This requires many skills from the SEO expert. How to create SEO content for content marketing (content that is specifically written so that search engines like Google understand it and can thereby rank it highly in the search results). How to earn quality backlinks from external sources and how to get local backlinks (e.g. backlinks from blogs in Hamilton / Ancaster / Burlington etc) to improve ranking position in Google local search. How to create high quality content for the blog–content that achieves low bounce rates (the number of people who visit only one page of a site) and high dwell time (the amount of time visitors stay on the site). Note that these are somewhat simplified definitions. Those are the basics of good SEO experts should know. Anytime you’re looking for a nearby SEO expert, make sure they can cover all those points above. But why are these points so important? The reason SEO experts in Hamilton and everywhere else are so obsessed with these factors is essentially because Google is. You’ve played “Simon says?” Well, Google is Simon. Simple as that. What Google says goes. Except, Google doesn’t actually say anything. Google’s ranking factors are kept hidden in a deep, dark cave in Google Land in order to prevent SEO experts from abusing the system. But, SEO experts in Hamilton and around the world constantly analyse data to find out the most important ranking signals on Google and other search engines. And because of this, we now know that there are over 200 ranking factors. These are the 200 factors that determine your ranking position on Google. The good news is this: You can cover many of Google’s 200 ranking factors fairly easily, and I’ll show you how in this guide. Plus, I’ll share some excellent resources for Hamilton SEO for local search, so you rank highly specifically for people searching online in Hamilton, Ancaster, Burlington and other nearby places. If there’s one huge weakness in the way most local Hamilton SEO experts (as well as SEO expert Burlington and Ancaster…) approach their work, it’s this: they look at the SEO strategy as a standalone thing and not as part of an overall online marketing plan. As a certified Hamilton SEO expert and a certified online marketing expert, I’ve gained a great appreciation and knowledge of the best SEO strategies and how they work together with the overall online marketing strategy. Speak to a Hamilton search engine optimisation expert and they’ll tell you that you need high quality content, backlinks, and optimised site and a good site architecture. All of which is true. Except for one thing: The only reason to implement these efforts is as part of your overall marketing plan. Sure, it is good to know how to get backlinks for SEO to improve Google search position and increase traffic to the business website. But if none of your traffic is converting on your website, the SEO expert is wasting their time because your site isn’t actually making you money. On the other hand, if you know how to get Google traffic to convert on your website, you can succeed with a low level of traffic. Point is: Never forget that your SEO strategy / online marketing strategy must work together. When you’re working with a Hamilton SEO expert (or an SEO expert elsewhere if you’re note local), make sure they know how your SEO strategy / online marketing strategy work together. When you do this, the SEO expert work becomes far more valuable because their SEO generates leads that convert. For instance, let’s say you own a dental practice in Ainslee Wood. SEO in this case is intended to bring in new patients. You know you can use search engine marketing to drive traffic to your website. So, you hire a local Hamilton SEO expert. Before long you’re getting thousands of visitors a month. But you’re not actually getting more customers. What gives? Perhaps your Hamilton SEO expert did not focus on local SEO, so visitors to your site are from all over the world, even though 100% of your potential customers live within a 5-mile radius of your dental practice. Always remember: your SEO strategy / online marketing strategy must work together as one cohesive whole. This is another area where a nearby SEO expert might stumble because, sure, they know how to do search engine optimization, but many do not know how marketing elements like buyer personas fit into the picture. When an SEO expert is working on the SEO strategy for a business website, they should always focus on the customers’ interests and pain points (the problems your business solves). This will enable them to create SEO content on the business blog that actually helps your customers, which in turn increases lead generation and customer loyalty. Every time you create SEO content for a business blog for lead generation, make sure you’re creating content that solves customers’ problems. When I’m hired as a Hamilton SEO expert for a large marketing project, I create buyer personas, and then create SEO content for the business blog around those buyer personas. This increases online lead generation and helps improv conversion rate. 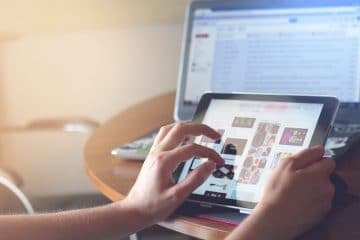 Take-away: The best SEO strategies for business websites are focused on solving problems for customers and speaking their language. When you realise this, you can ascertain the types of keywords to write around the theme of your blog posts. You will be able to create content for customers that addresses their problems, making them want to work with you. 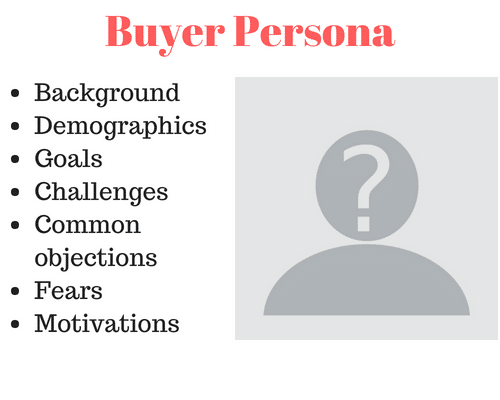 If you’re working with an SEO expert, make sure they understand your buyer personas. Once you have a good grasp of your buyer personas from step 3, you can use that knowledge to do your SEO keyword research for the business blog (and guest posts). Keywords research is the stage at which we determine the main keywords to create content around. For instance, let’s say you’ve hired your Hamilton SEO expert for a restaurant website—let’s say a Chinese restaurant to be specific. So your Hamilton SEO expert writes blog content about the most popular Chinese dishes. And they can make it even more targeted by writing around the keyword Most popular Chinese dishes in Hamilton. Your local SEO expert (or me, if you would like to work with me) can help you to find the perfect keywords for your website. 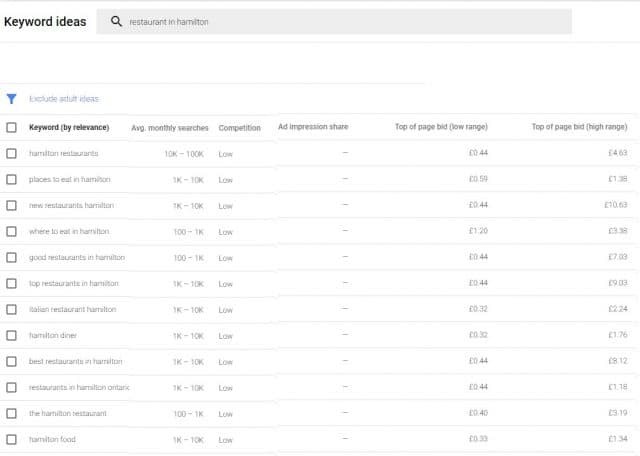 This is done via a combination of tools, of which the most popular is Adwords Keyword Planner. Adwords Keyword Planner enables you to enter a search phrase and find the best keywords for your idea. Here are the results for “restaurant in Hamilton”. For some blogs, it will be immediately obvious what the right keywords are. Chinese restaurant in Hamilton seems pretty obvious. Some topics are not so obvious. Imagine you are doing a lawyer’s SEO in Binbrook. You want to hire a Binbook SEO expert for lead generation for your legal practice in the area. Your local Binbrook SEO expert says they want to target technical keywords. But hold your horses. Is your local Binbrook SEO expert right to do so? Would a local searcher on Google search by technical terms such as “toxic tort lawyer”, or would they target more generic terms like “What are my rights in [such a case]”? In cases like these, it’s best to choose SEO keywords based on what the searcher would enter, even if those are not actually the technical terms. Take-away: When writing blog posts, make sure to target specific keywords that your potential clients would enter into the search engine (use their language, not the niche-specific nomenclature). Now it’s time for the single most important part of SEO: writing good content. The world’s best SEO experts will not achieve much if you don’t have high quality SEO content for the blog. The link above shares the best tips for writing effective content. In order to create SEO content for a business blog, create content that both Google and your readers understand. To make content on the business site rank highly on Google search, make sure to work your keyword in your content. Do not spam the keyword or you will receive a Google penalty. Use variations of the keyword in the anchor text of internal links that point to the page in question (more on this in just a sec). Perfecting the content creation process is as much art as science. You can get achieve great things by following my free guide to planning blog posts. This is something any SEO expert will know how to do. Take-Away: When creating blog posts, make sure to write high quality content and remember your keyword SEO strategy. As a Hamilton SEO expert I always discuss the content with client’s at the planning stage to make sure it properly represents their business. Internal linking is the art and science of optimising the way your blog posts and other pages link together in your site. This is one of the key ways in which as SEO expert improves Google ranking position for your business’ site. Studies have shown that a site’s internal link structure can have a profound impact on a site’s ranking in Google. As a Hamilton SEO expert, I find that this is one of the single most important parts of SEO. This is an in-depth topic, and something I have extensive knowledge about, so I have created a separate guide to optimising content structure. External linking is both the most challenging and the most rewarding part of an SEO expert’s work. This is all about earning backlinks from external websites. Essentially, external linking is the process through which the SEO professional gets other webmasters to link from their blog to ours. As a Hamilton SEO expert, this is one of the main benefits I bring to clients: I have a “special sauce” for acquiring external links. External links are one of the most important of Google’s ranking factors. By earning good quality backlinks you will dramatically improve search results position. Meet other business owners in person to create a real relationship. Fostering relationships will naturally earn backlinks. This is an art unto itself. Let’s take a look at an example of link-building scheme for local SEO in Hamilton Ontario. Let’s say we are a new real estate agent just looking to get started in Hamilton. We understand the value of local SEO for real estate. The more traffic we earn through Google, the more our business will grow. And to make that happen we need to earn backlinks. So, how to get backlinks for a local site. These are just a handful of ways to earn backlinks for local SEO in Hamilton. Hyper-local SEO is valuable for businesses that want to target a specific area. For instance, let’s say you’re doing local SEO in Stoney Creek for a restaurant. You want to come up top for search results for restaurant nearby or for when your potential customers search for restaurant near Devil’s Punchbowl. That way you can target potential customers who are either nearby your restaurant right now or who are planning to visit a restaurant when they’re in your area. Either way, you want to come up top of Google for search results related to your business and in your area. How? Include references to your location in your webpages (e.g. “We’re a family diner located in downtown Stoney Creek”). Take-Away: To get the most out of hyper-local SEO, experts should look for opportunities to integrate your location into your content marketing plan. As a Hamilton SEO expert I find this is currently one of the most valuable SEO services in Hamilton right now. One of the most important parts of an expert SEO’s work is making sure your page loads fast enough. To test how fast your site loads, I recommend using Google’s PageSpeedTest. You should get the green all-clear sign for desktop and mobile. If not, you will need to improve your page load speed. Page load speed is an important Google ranking factor. A slow page load speed will affect every part of your site. And not just in Google. Studies show that as little as a 2 second delay will cause a 4.3% drop in revenue from a website. Good news for Hamilton SEO experts is that it is relatively easy to achieve a good page load speed (because internet speeds in Canada are faster than most other countries in the world). 29 percent of online traffic in Canada is on mobile (Statista). And Google considers mobile optimisation one of the most important ranking factors in 2018. Simply put: It’s imperative that your business’ website be optimised for mobile search. Test it in Google’s Mobile-Friendly Test. As a Hamilton SEO expert, I’m still slightly surprised when a site has not been mobile optimised. It is 2018, after all. 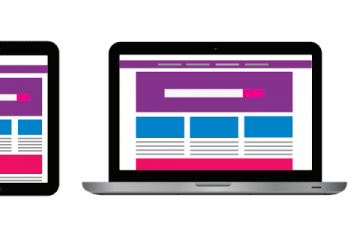 Mobile optimisation includes making sure the page loads quickly enough when on mobile, and ensuring that links and clickable elements are large enough to be used on mobile. With 28 million Canadians using mobile to access the internet, your business will be leaving money on the table if your site is not mobile optimised. This is especially true for businesses of an immediate nature (such as services people need quickly while out of the house). This is something a professional web designer in Hamilton will be able to help with. All SEO experts know full well how badly a Google Penalty can hurt a website and a business. That’s why, as well as practicing good SEO, it’s important to avoid bad SEO too. Black-hat SEO practices like using link farms and clever redirecting of links will all get you punished in Google, as will spammy content, low-quality content, low-quality backlinks, and any effort to “unnaturally” influence the search algorithm. There are some dodgy Hamilton SEO experts who still use these techniques for clients even though it is firmly established that these strategies in 2018 will lead to a Google penalty. Best practice is to avoid such SEO strategies like the plague. They will only harm your site. With this exert SEO strategy, you can take your online marketing to the next level. As the leading Hamilton SEO expert, my passion is to help businesses in Hamilton, Stoney Creek, Ancaster and Burlington to succeed online. Let’s work together so you can enjoy all the amazing benefits of an SEO optimised site.